Get Early bird discount now ! Special activities are planned for Teens/children enrolled in extended camp. Children less than 13 yrs need to be accompanied by at least one parent during night. If necessary, parents attending the camp on Thursday can leave for work and return in the evening. Experienced youth interested in serving as counselors are advised to confirm their interest by sending email to sheenap.96 at gmail.com. Please mention subject: Youth Counselor for Shantineketan Camp. The email must be received by May 30, 2019. We have limited position and hence it will be first come first serve for qualified candidates. Also please fill out this Counselor/CIT form. To be a counselor, the person has to be in college or completed college, and has experience as counselor in training (CIT) in our camp; Requirements for CIT is that they have to be in high-school or above and should have attended our camp earlier. 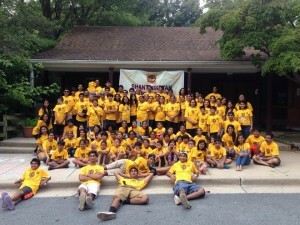 Children interested to be Counselor or CIT at camp need to fill out this Form. 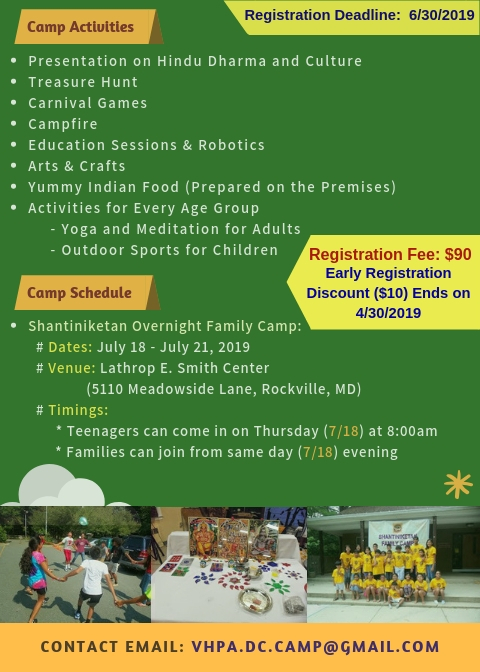 $90 for campers of regular/ teen camp. $25 For children of age two to five years. No charge for children age two and below. If more than 3 campers are registering from same family, a special group discount is automatically applied. 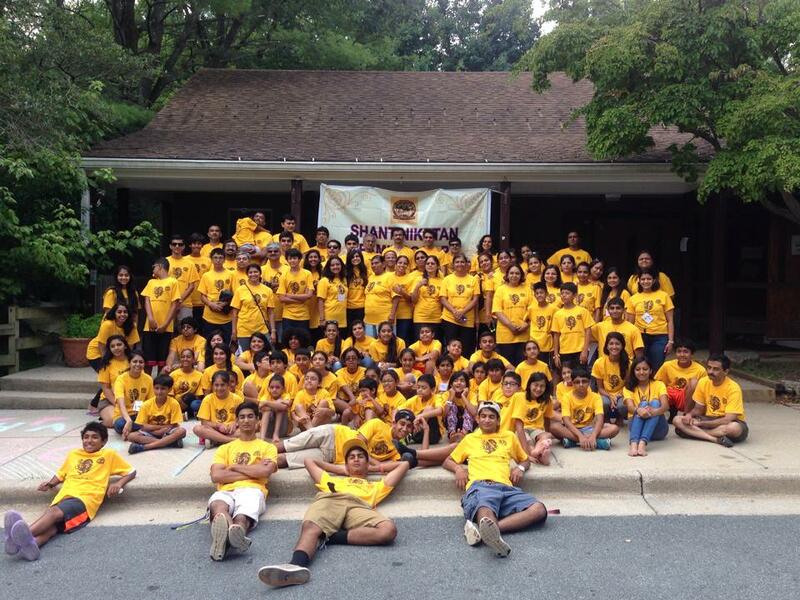 Camp 2014 was a memorable camp! Click here for a report in pictures! What to expect from the camp? Read the reports by past camp attendees of camps in 2009 and 2011 containing nice description of events and good pictures. Like every year, camp coordinators put in a lot of efforts on providing a quality educational sessions regarding Hindu philosophy and its applicability for life, arts & crafts, games, group discussion sessions talent show are integral part of the camp. Also people who have been attending this camp for many years always relish mouthwatering Indian and international food prepared by our volunteers. 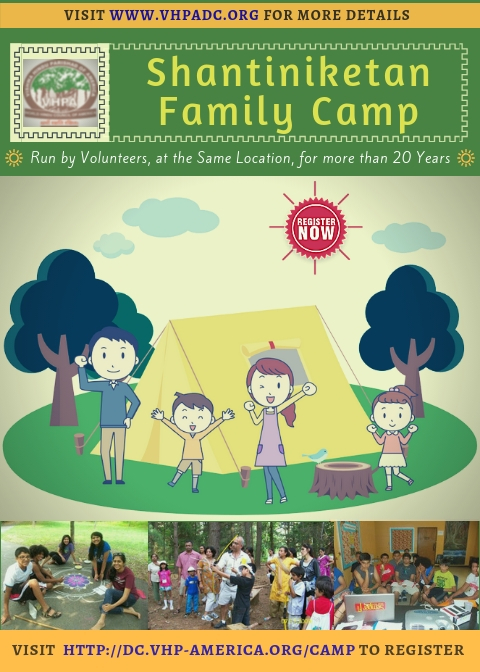 The camp provides an ideal relaxation, fun and learning experience for the entire family.